So a cluster of medieval buildings, a closed community, Master and Brethren, a secret society even. 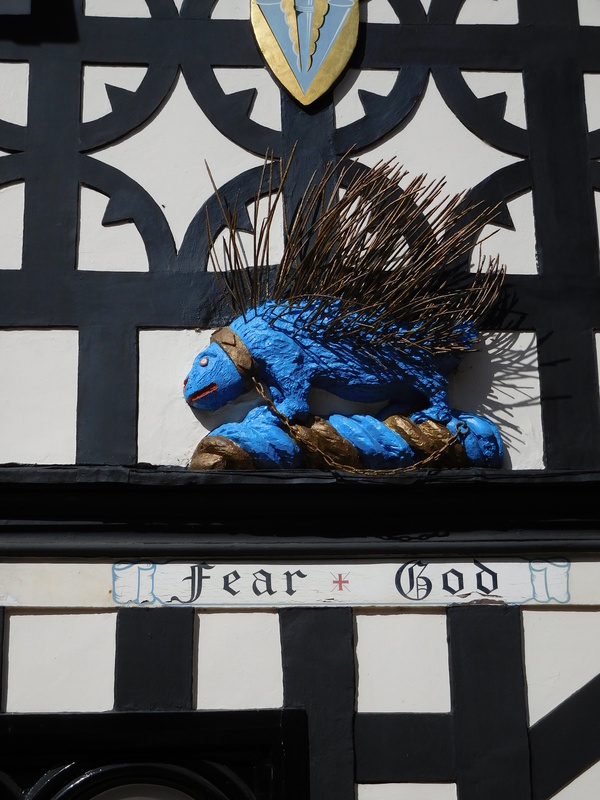 I walk into Galleried Courtyard, crunching on the gravel, neat as a furrowed field, transfixed by the livid blue porcupine glaring down at me..’fear + god’. It’s a guardian, perhaps, of the piety expected in this other world ? My fingers tingle with the thought of its spines. I climb the topsy turvy wooden staircase, holding the smoothed wooden handrail to steady myself. The stair creaks gently as I climb. A giant person of the twenty first century, I need to bow my head, as the staircase roof is lower than me. I pass private Bethren apartments , small stout doors firmly shut. Imagine corridors within, leading to Hobbit territory in the heart of this community. Open the gnarled wooden door leading into the Great Hall. It’s dark in here, compared the bright blue outdoors. I teeter towards the window, as the floor drops down. Breath in the musty, old oak beams, smell, leather and rust from iron press in the corner. The old oak dining table gleams in the corner, with centuries of waxing. Next into the intimate Knot garden, box shrubs tight as a cross word puzzle, clipped as globes, crescents, oblongs. The garden smells of cedar wood, and a hint of turpentine. I want to sit on the bench there, breath in the calmness of this private space. And now, follow the brick path into the Master’s Garden, at the heart of this community. A walled formal garden tucked away, above the town buildings, a haven. One step over the threshold and you are in.. the eighteenth century. I love the way the plants sprawl out of the formal beds, bright pansies. I see a beehive, and a ‘pineapple pit’. The sky is a brilliant blue. I trail my hand over the herb bed, pinch a bit of rosemary, chew the little spikes, so aromatic. 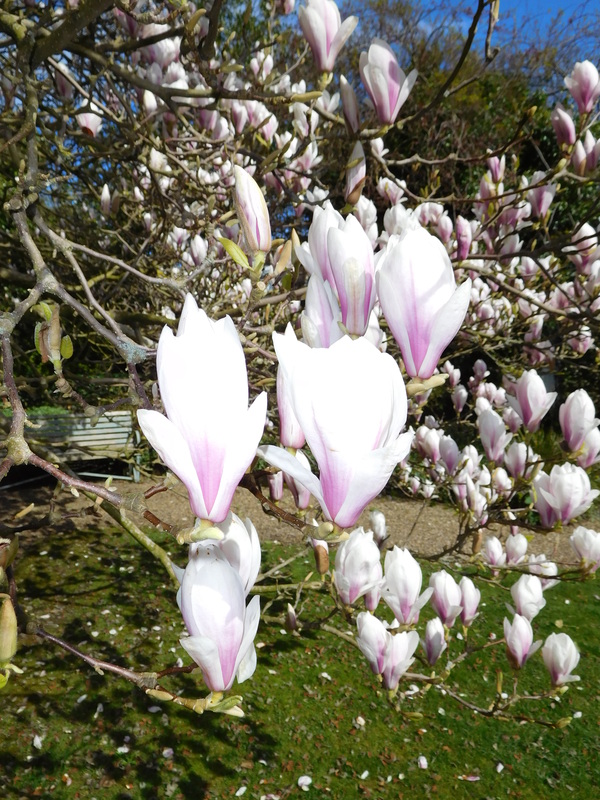 The Master is right, here are the magnificent, almost monstrous magnolia flowers ! Weirdly I’m reminded of Doctor Who, the Time Lord, and his visits to different time zones. The Master and his Bethren, in this time warp, are both familiar as school history, and other worldly at the same time. Time to leave, go and find a Costa coffee. Glad you like the magnolias – I do too. Very exotic blooms aren’t they. Aren’t they just ! I imagined the magnolias have been tenderly cared for in their seclude Master’s Garden setting, so they are in radiant health. Fascinating; I enjoyed that. Though I have to say the porcupine looks more like a spikey fish; I assume they’re unique to Warwickshire. Fascinating; I enjoyed that. Though I have to say the porcupine looks more like a spikey fish; I assume they’re unique to the Warwickshire. 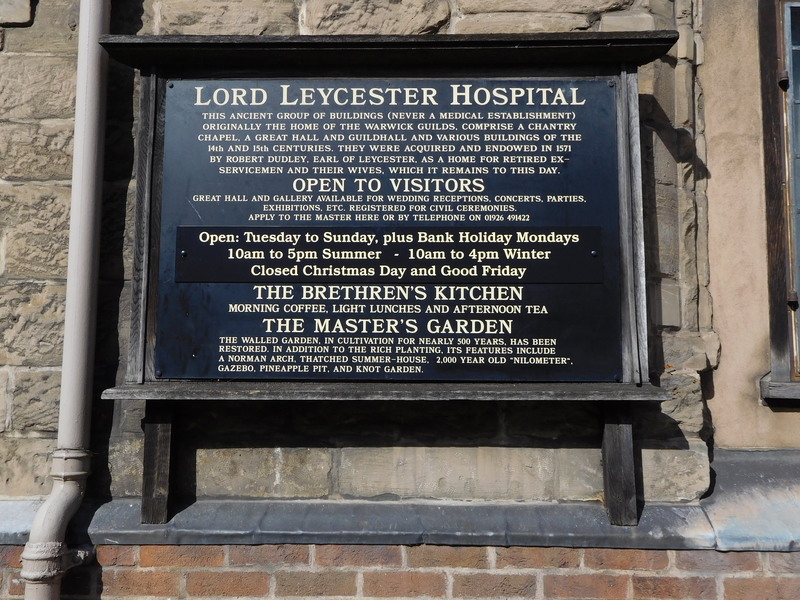 Glad you enjoyed the ‘tour’ around the Lord Leyster. I was intrigued by the blue porcupine – never seen one like that before – looks sort of pagan to me ! You’re right – more fishy than porcupiney.